Close enough! So far I have mainly (re)learned that I still have not rectified the basic problems of my wardrobe. And I (re)learned that I need to get rid of stuff that I no longer wear, for whatever reason. At least on that point I've taken action. I donated three big trash bags full of clothes this weekend, including some me-mades that were made solidly enough but didn't fit any more. So, I do feel better after having gotten rid of stuff. But I still have a huge mending pile and I still lack basic, well-fitting, pleasing things that I can wear both for work and on the weekend. It is really hugely tempting to just go shopping! But then I remember that my most recent RTW purchases are so-so at best. OK, that's not true. I got some good dresses from People Tree recently. But the two pairs of pants I've bought in the last year don't fit particularly well and aren't especially flattering. But then after I remember that, I (re)remember that I have precious little time to sew nowadays and I definitely do not have the time to get everything done in the timeline that I'd like. Sigh. I guess it's a question of prioritizing and picking my battles, like everything else, right? Anyhow, I didn't take pictures of my outfits on Friday through Sunday because calling them "outfits" is really stretching the meaning of the word. But I was clad in self-made things on all three days. Monday I went back to work so I had to scrape together a proper outfit. 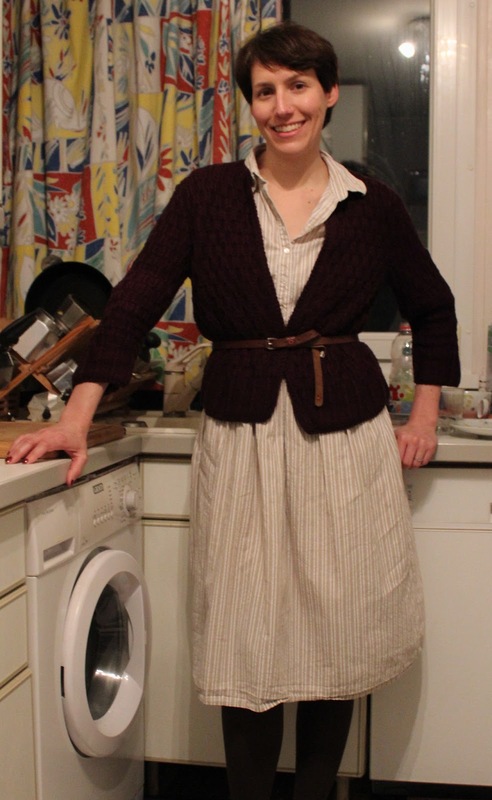 Here I am wearing a staple dress (that is looking a bit had in person) and my Renaissance Basket Stitch Cardigan. It got cold again so I brought about the boots, but I took them off before snapping the photo (at nearly 11pm!). 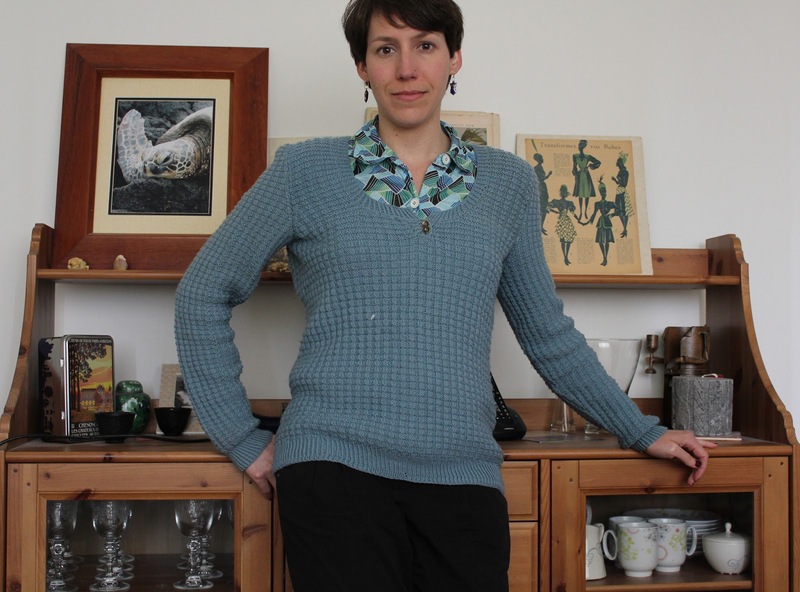 I suppose it is odd to be wearing wool in mid-May but it's a stroke of luck for me because if the weather got really warm, I would be hard-pressed to find things made by me. I like your outfits, particularly the first one. I also need to clean out my closet, so far I have one bag with stuff to donate, but there's plenty more to get rid of, I'm sure. Glad to hear that your weather is as foul as the stuff we have here at the moment.After a brief interlude of wearing summer dresses it is back to the winter woolies.I keep making summer clothes but somehow I just don't think I am going to wear them! I like your dress&cardi outfit. And I'm sure I've mentioned before, the blue sweater looks lovely on you! I know what you mean about not rectifying the basic wardrobe problems I have; the reason I decided not to participate in Me Made May this time. Good on you for going with it; both the outfits shown look great. I like both outfits - your knitwear is fabulous. Your analysis and actions are interesting...I wait to see what basics you decide to make. People tree dresses always look lovely, which ones did you buy?? Yeah, me too, I'm wondering what I'll decide to make! ;) I'll have to figure out a way to work in at least one of the People Tree dresses this month because normally I wear the flowery one once a week. Too bad I didn't make it! I really like your Thermal sweater. 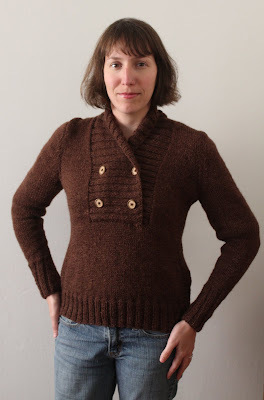 I've had this on my Ravelry faves for several years now but I doubt I'll ever get around to making it, it's got so far down the list at this point!